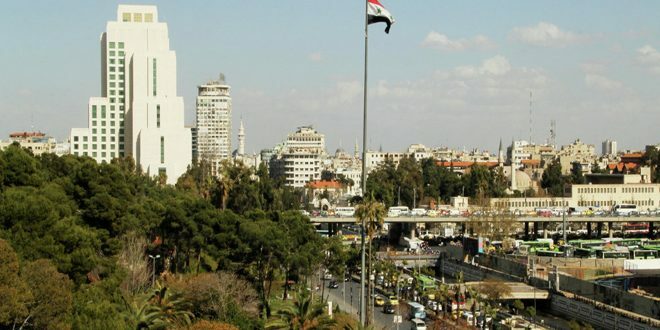 Damascus, SANA – Deputy Prime Minister, Foreign and Expatriates Minister Walid al-Moallem said Syria is ready to go for a Syrian- Syrian dialogue without any preconditions and will not comply with any precondition set by any party whatsoever. Speaking at a press conference on Saturday, al-Moallem said the delegation of the Syrian Arab Republic to the talks in Geneva showed belief in the Syrians’ right and Syria’s future. He referred to Syria’s reply message to the letter sent by UN Special Envoy for Syria Staffan de Mistura on January 26 inviting the Syrian Arab Republic’s delegation to participate in the Syrian-Syrian dialogue. 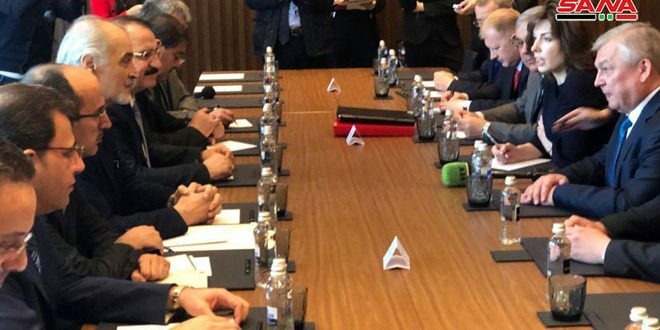 The Syrian letter, al-Moallem said, stressed the Republic’s delegation’s readiness to take part in the dialogue based on the two Vienna Communiqués and the Security Council resolution no. 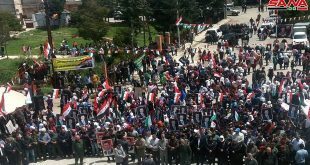 2254 which state that the Syrian people alone have the right to determine their future and that dialogue should be Syrian- led and one among the Syrians away from foreign interference and without preconditions. Contrary to that, the statements of the “Riyadh opposition” delegation, even before they went to Geneva, were full of preconditions, including those about the humanitarian situation, said al-Moallem. When the three terrorist bombings happened in al-Sayyeda Zainab suburb near Damascus, the crime was internationally condemned, especially by the UN Secretary General, the Security Council and the European Union, he noted. “Our delegation,” al-Moallem said, “then wanted to put the Riyadh delegation to the test” and asked for a condemnation statement of the crime, especially after a member of the Riyadh delegation” named Salem al-Maslat accused the Syrian government of being behind the crime. 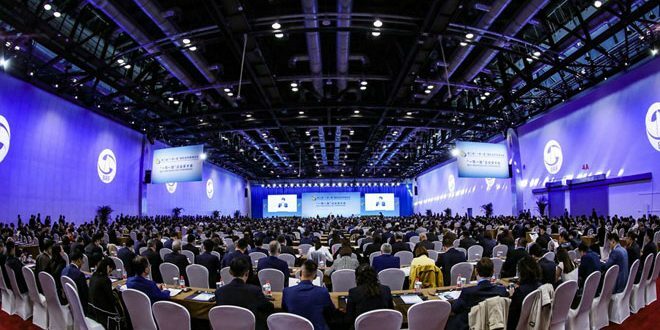 The “Riyadh opposition” delegation however did not issue such a condemnation statement, as it was clear that they received no instruction to do so. The list was only presented at the concluding session at the end of the talks, which had not even started, he explained. He said the “Riyadh opposition” delegation had already decided to walk out of the dialogue, particularly after the victories made by the Syrian Arab Army, mainly those in the northern countryside of Aleppo, referring to breaking the long time terrorist siege of Nubbul and al-Zahraa towns. 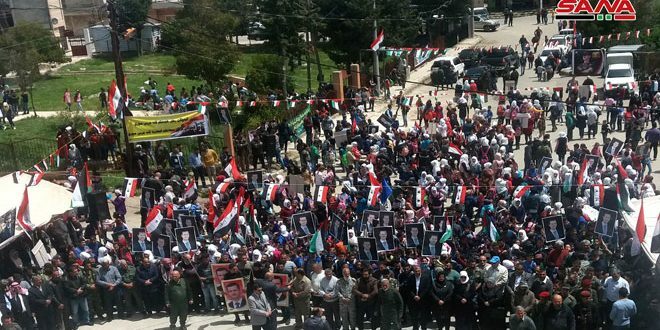 “We hoped the Riyadh delegation, who talked about humanitarian issues, would feel happy just like our people were happy with breaking the three-and-a-half year siege of 70 thousand locals of Nubbul and al-Zahraa, but they packed their luggage and left,” added al-Moallem. “They didn’t feel happy simply because their affiliation is not to the [Syrian] people,” he elaborated. He stressed that regardless of the Geneva track, the Syrian government pays the greatest attention to the humanitarian issues and to providing food and medical support to all its people, mainly those who are besieged by the armed groups and being used as human shields. “Anyway, they did right walking out because they are not at all free to make decisions at the talks,” he said. He noted that the two Vienna Communiqués and the Security Council resolutions assert de Mistura’s responsibility of forming the opposition delegation and also stress on having the broadest possible representation of the opposition groups. However, al-Moallem said, de Mistura started picking names in a personal capacity and was being selective and named some of those whom he selected as advisors. He pointed out that the delegation of the Syrian Arab Republic told de Mistura that it was important to not repeat the mistakes of Geneva 2 in that the representation of the opposition groups should be the broadest one possible in compliance with the resolution no. 2254, which cited the opposition groups of Moscow, Cairo and Riyadh. Al-Moallem found it strange that de Mistura did not meet with the delegation of the opposition from inside Syria, wondering why those have not been represented, when they have stayed in Syria all through the past period and they are national opposition who have ideas different from those of the government. “We want the broadest possible representation of the Syria opposition groups in Geneva conference, including the Kurds, because we want an applicable political solution that can be implemented on the ground,” he stressed. About de Mistura’s role, al-Moallem said de Mistura is the facilitator of the dialogue process. ‘We acknowledge only what comes out of the Syrian-Syrian dialogue…and those who talk about assurances are mistaken,” he added. He noted that Erdogan has dreams about the Ottoman state and these dreams are fading on the ground, referring to the popular rejection which Erdogan received during his visit to Latin America. “This issue is one thing and Geneva conference is another thing,” he added. “We are very keen on Syria’s sovereignty and territorial safety and ridding it of terrorism…Aggressors who dare attack Syria, be them from Turkey, Saudi Arabia or other, will return in wooden coffins..We are a sovereign country and we will repel any violation,” al-Moallem said in a stern warning. Answering a question about announced visits to Russia by government and opposition representatives, al-Moallem said the Syrian government has received no invitation for a Moscow 3 round of talks, indicating that the Syrian crisis can only be solved politically. “We are leaving no stone unturned to reach a solution. If Riyadh delegation comes or not, this is their own business,” he added. He said that counterterrorism efforts run in parallel political work, vowing that no effort will be spared until eliminating terrorism, namely ISIS and al-Qaeda-linked organizations in Syria. Jordan’s position on Syria remains unchanged as “convoys of terrorists are still crossing borders coming from Jordan to Syria and not the other way round. It is a one-way ticket. Because those who return to Jordan get killed, “he added, attributing the army’s recent successes in the southern region to the bravery of the Syrian army and popular support it enjoys rather than a change in Jordan’s stance. Commenting on the issue of ceasefire, al-Moallem echoed the Russian Foreign Minister’s statements that this is not applicable until borders with Turkey are controlled. “The same holds true for Jordan’s too,” he added. Al-Moallem said, in reply to a question about UN-brokered agreement about ISIS evacuating areas south of Damascus, al-Moallem said the agreement stipulates that ISIS members leave al-Hajar al-Aswad area and the areas surrounding it for Raqqa with their families. Others, he said, have stayed behind due to ISIS lack of transportation to carry them to Raqqa. Al-Moallem denied the existence of Syrian intelligence cooperation against ISIS with France or Britain, saying Syria does not exploit counterterrorism to make political gains. 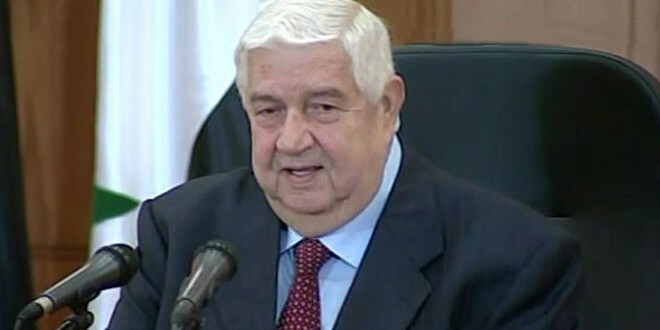 Al-Moallem said the Syrian government is ready to provide humanitarian aid for the Syrians wherever they are, but said guarantees are needed to make sure that the aid will not end up in the hands of terrorists, citing the Russian and Syrian air force dropping more than 90 tons of humanitarian aid over areas controlled by ISIS in Deir Ezzor. The Foreign Minister called on those who haven’t yet dropped their arms to go back to their senses and get back on the right track as they still have the chance because the Syrian army is able to win in any area.